Nationwide, the idea that vagrancy is a lifestyle deserving legal protection is hampering efforts to rehabilitate the homeless and protect quality of life for the rest of us. Across the United States, temperatures are plunging, making it deadly for the homeless who refuse to go into shelters. Each year, hundreds of these vagrants die from exposure on the streets. Yet blinded by progressive ideology, so-called "advocates" for the homeless — including the Obama administration — are defending a "right" to stay on the streets. Even if it means freezing to death. Vagrants aren't the only victims of this misguided ideology. It's also robbing the rest of us of the safety and cleanliness in our neighborhoods. In New York City, a political battle is erupting over Mayor Bill De Blasio's indulgent tolerance for street living, no matter what its impact. But the state's governor, Andrew Cuomo, is challenging it. On Sunday, Cuomo announced a mandate that police and social service agencies move vagrants into shelters when the mercury falls below 32 degrees. Common sense, right? Not to De Blasio and his coterie of left-wing lawyers and homeless advocates. Staying out in frigid temperatures is a "rational, conscious decision," says Norman Siegel, former head of the New York Civil Liberties Union. The homeless "still have rights to make that decision themselves," says De Blasio. Not a "right to freeze to death, " Cuomo shot back. De Blasio argues that under state law, police can move only the mentally incompetent against their will. Cuomo's lawyers concede that. But staying on the street in icy weather is a sign you're mentally unstable. There's no love between Cuomo and De Blasio, and Cuomo ambushed the mayor with the announcement. But the mayor needs to call off the legal attack dogs. Every year, several homeless New Yorkers die of exposure. To comply with current law, police will probably have to take the unwilling to hospitals for mental evaluation, instead of to shelters. When former New York City Mayor Ed Koch ordered police to get vagrants off the streets during cold waves in 1987, they picked up Joyce Brown off the streets and took her to the hospital. Brown was described by the New York Times as a "dirty, disheveled and abusive person who lived in her own excrement ... and suffered from chronic paranoid schizophrenia." Siegel sued for her release, describing her fetid existence as a "fearless independent lifestyle." That's the same wacky thinking De Blasio and Siegel are trotting out now. De Blasio's lawyers actually point to Joyce Brown like some folk hero, claiming her case paved the way for homeless "rights." But Brown, who was released by doctors before the state's highest court could rule on her confinement, wound up back on the streets, using drugs again. Nationwide, the ideology that vagrancy is a lifestyle deserving legal protection is hampering efforts to rehabilitate the homeless and protect quality of life for the rest of us. Some federal courts reject the claim, but unfortunately others buy in. In 2006, a federal appeals court backed up New York City Mayor Rudy Giuliani's efforts to get vagrants off the streets, ruling that there is no "right" to build a cardboard shelter and sleep in public. And this fall, a federal court in Boise, Idaho, allowed police to clear an encampment of vagrants — an Obamaville — and move them into a shelter, over the objections of the Obama Justice Department. The DOJ argued people have a "right" to sleep on the street if there are no shelter beds. Boise proved there are beds, many still unused after the clean up. 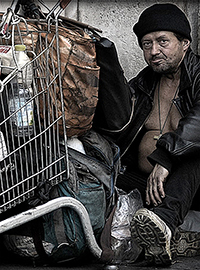 Unfortunately, the federal Ninth Circuit Court of Appeals is squelching Los Angeles' efforts to halt vagrancy. This court has ruled that homeless people have a "right" to sleep in their cars and store their possessions on the sidewalk when shelter space is lacking. But New York proves that the real issue is not shelter beds. There are plenty. It's the left's tolerance for homelessness as a lifestyle — our public safety and quality of life be damned. However, not just vagrants are victims. Sunday night, a McDonald's worker was stabbed to death in the Bronx by a homeless man heading to the restaurant's bathroom. And a midtown steak house is reporting a 24 percent drop in business because of a homeless encampment outside the restaurant. These are victims of a city's warped progressive ideology. From New York to Los Angeles, businesses are intimidated and law-abiding residents are harassed and threatened by street dwellers, abetted by an army of progressive lawyers and the Obama administration. Betsy McCaughey is a senior fellow at the London Center for Policy Research and author of "Government by Choice: Inventing the United States Constitution."